Pondering, mulling, thinking, analyzing, planning, hoping, etc. Stay with me on this brief venture through exploration & pottery research. So today though, I research and find a resting area in the rabbit hole I’m venturing where I exclaim (silently of course), “Ahhh! My college chem courses have just laughed at me!” (see picture below “Figure 2”). What a good moment for some humor! Give THANKS for each breath, both in and out. For each of moment can bless you with #yet-to-be-realized wisdom and love. –Patsy Cline sang the song, “Crazy”. Wood fired pieces always blow me away mainly due to the natural effects of flame, heat, and earthly elements. 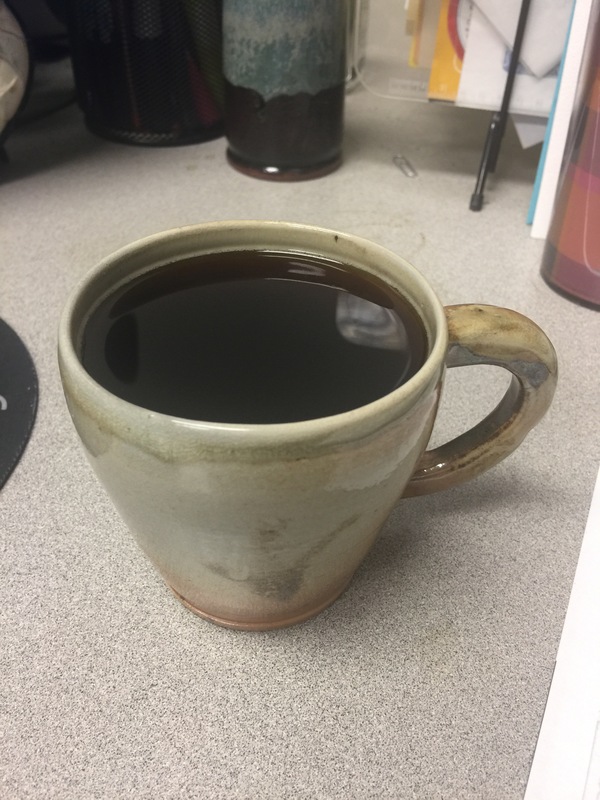 This cup is from the most recent wood-kiln firing. Happy Memorial Day! Thanks to the brave men and women who died in service of the U.S.A. This years’ woodfiring was postponed slightly due to flooding. Two weeks ago the wood firing team commenced the process with storing of wood and loading the kiln. Loading the kiln is definitely a fun event due to the number of good folks who come to help. I missed the loading because of my 9-5. For several days, 4 hours a day, the team fed thewood-kiln and last Thursday the kiln was unloaded. Now the unloading part is the one phase that I haven’t experienced yet so I was “stoked” to get that chance… but as it turns out my hot water tank wanted our full attention that day. C’est la vie. Now I can change the elements of those suckers! LOL. I vow to experience the unloading at the next wood firing event and then some! It was a beautiful day in central New York on Saturday, May 28, 2016. By beautiful, I mean the clouds were puffy white against a sky of deep blues, and although the breeze was slight, the temperatures were in the low 90’s and the sun was beating us down like a.. well, let me just say it was HOT! We’re not exactly used to 90 degree weather here in CNY, especially so early in the season – but like most folks I talked with I wasn’t complaining. We arrived to the destination of the first wood firing of the year (there will be 2 more sessions this year)! The area seemed most welcoming with a good deal of positive loving energy. And upon quick glance, the care and work associated with building a wood-firing spot were definitely evident. We proceeded down the path to the hot spot – literally, where high stacks of hard and soft wood sat patiently waiting for their turn to help realize the dreams and hopes of those who created more than 400 earthly creations. Sean was the only volunteer present at the time. He welcomed us warmly (excuse the wood-firing pun), sharing the history, his insights, teaching us about the wood-firing process and the furnace. We are definitely appreciative of his wealth of knowledge and generosity! Sean shared how the surfaces of the pottery pieces could be affected by their placement and direction facing the fire. The addition of soda ash circulates in the furnace to help produce a glazed effect on as many surface locations as possible. We stayed only a short time but learned a lot! I am truly in awe and in appreciation for all the people that worked together to make the wood firing a reality. 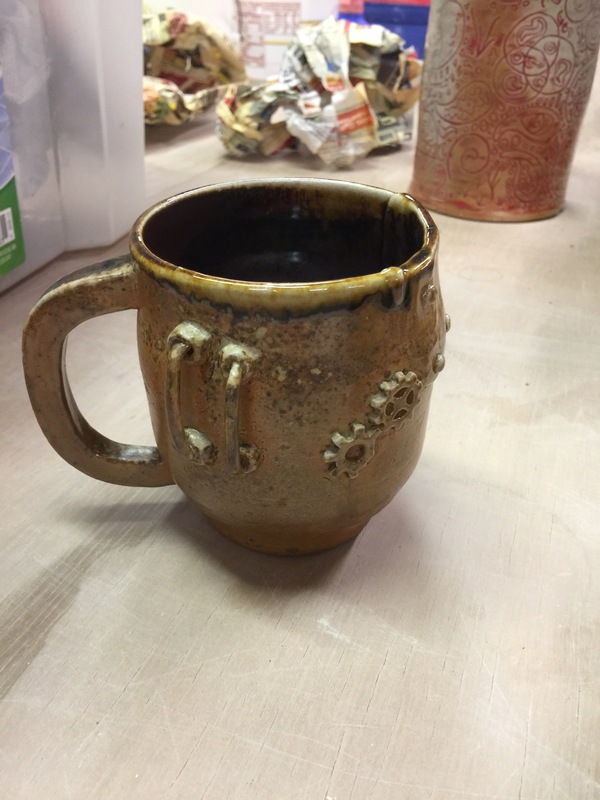 I spent several months prepping for my first official wood-firing of pottery pieces that includes mugs, vases and a pitcher. The reason why it took me several months to create 20 pieces was that the time I allotted myself was divided among the class project for serving items and the home project of building a chicken tractor! Imagine that, me – a city girl – building a mobile chicken coop. In all instances I am so grateful for the support of my family through this period in my life, and through the years. Heart-based creations and experiences all around. 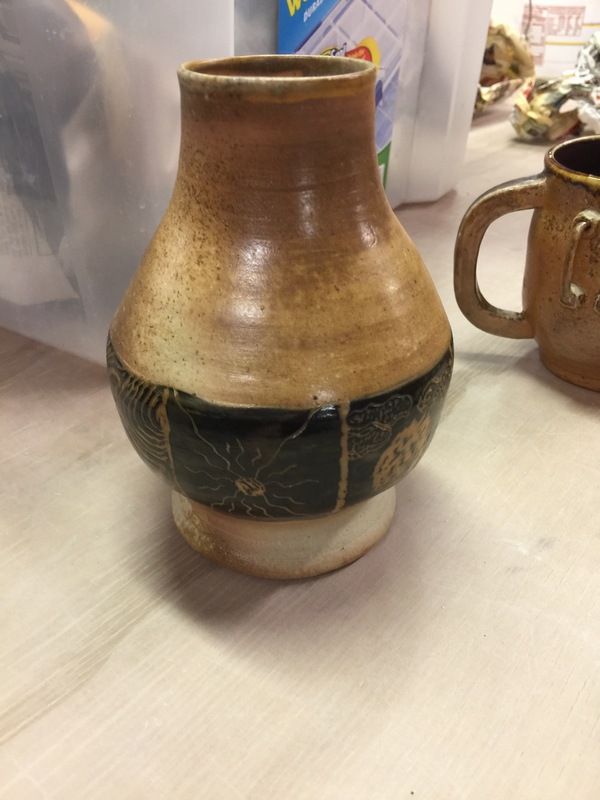 The picture is a sample of the wood-fired pottery pieces, some with a hint of a glaze called “Pig Iron”. It’s a mystery how the pieces will turn out – and that’s part of the fun!